At Constitution Beach, the kids are very energetic and so excited to come every Wednesday and fish and explore the beach. 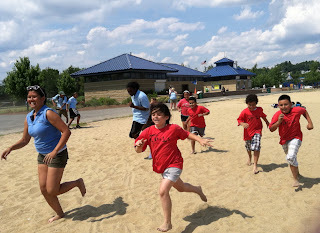 At first, we played sharks and Minnows to let them run around and have a good time. I played as well, and so did my other coo-workers. The kids run faster than I do and I was caught when the game started. I had to sit on the floor and pretend that I was a crab trying to get people. After we played the game, we had the kids explore the beach, where they found a bunch of hermit crabs and snails. No one caught a fish but they tried so hard to do so. I explained how the hermit crabs have hard shells to protect themselves from getting eaten. Also when they get bigger in size, they have to leave the smaller shell and look for a bigger one. We put everything in the touch tank, and if there was something that we didn't know about a certain animal, we would look it up in the guide book.